The new Operating Procedures have been posted to the website and are in immediate effect. I have rec’d a few phone calls and emails about best practices Please note the following bullet points and comments. * Clubs have been required to have Eligibility Binders for several years. The historical enforcement on game day has been poor at best and has largely been a “gentlemens agreement” not to do a proper cross check. * The “gentlemen’s agreement” can no longer be waived by TRU policy. Binder exchanges are expected at all League and Social matches that a TRRA referee has been assigned. * TRRA Referee’s are not involved in the Binder checking process. If a club has a pre-match protest, they can notify the referee. This does NOT mean the match is cancelled. Games will be played under “protest”. The only acceptable reason not to play a match would be for player safety reasons. This is the only “ruling” that the referee will make outside their normal match day procedures. * Typically both teams arrive an hour prior to KO. It is best that the two designated Manager/Bookkeepers will meet of to the side and go through each others binder. In it should be a current USA CIPP roster or CMS printout for leagues using the CMS (Mens D1, D2, D3 and Collegiate D1 Men). Additionally, there will be photo ID’s and proper proof of citizenship. It is recommended that the order of the book match the CIPP roster for ease of matching or in number order to match CMS roster. * The two managers will either note that the Binders are in order or there is missing information that would cause the came to be played under protest with Union follow up to be done via Divisional Secretary’s and Union as is applicable. * At this time the match day 23 for Team A can be inspected by Manager B. If all the paperwork is properly in the binders, the players need not bring anything with them and only need to be visually verified by what is in the Binder (photo id / proof citizenship). This should take less than two minutes to look at 23 faces. Team B will then be inspected by Manager A with the same process and should also take less than two minutes. * This process should probably be done 20-30 mins prior to KO. If done as noted below there will be minimal disruption to either’s team pregame routine. * The key to this process is (a) preperation and (b) cooperation. If both teams do the required diligence during the week, there will be little to no game day disruption. * If you do not know what a proper binder would look like and be comprised of please contact either Myself or your Division Manager. Unfortunately the year has not started off well as it relates to Match Protocols. We understand that there is always turnover in club officers and various related roles (match secretary) but this is the lifeline of doing business within the Union and these policies need to be communicated down the line. We have had almost a dozen games go uncovered for various reasons. Games are being cancelled, rescheduled to new times, moved to alternate locations, etc. When these changes are done they must be correctly posted on the TRU master calendar and must be done with the knowledge and consent of the respective clubs, referee scheduler and assigned referee. Teams showing up with no referee and referee’s showing up with no teams is a waste of time, effort and money for all. Alan Sharpley has gone in and cleaned up the existing fixtures and is using an formating of “X @ Y”. Thus we are listing “Visting Team @ Home Team”. Please besure to adapt this same formatting to ensure that we are all using the same standard across the Union. Thank you in advance for your cooperation and diligence in this matter. Please note that there have been several important documents added to the TRU webpage. The TRU Participation Agreement is a REQUIRED document for each Club. The deadline for a signed acknowledgement form will be extended to Sunday, October 31st. These forms can be emailed to: tru.president@gmail.com or mailed to P.O. Box 980405, Houston, TX 77098. The TRU Operating Procedures have been cleaned up and updated since their last official publication in 2000. Most of the document is largely the same as we have been operating under in recent years. A key point to note is that ALL clubs are REQUIRED to exchange proper forms and perfom ID checks in all League and/or Playoff matches. This is non-negotiable and can not be waived by the Coaches/Captains. The document still has some minor revision to be made but are more cosmetic in nature and any material changes will be posted via the web per normal. The 2010 Field Policy is an extension of the prior policy that was tested over the last 18 months. The requirements are clearly laid out and are required for ALL MATCHES. Repeated safety issues and Referee abuses have mandated that we take a more proactive approach to the way play the game and due our due diligence in protecting the participants. Exceptions to the policy must be pre-approved by the Union. Please be sure that your field preperation teams and Coaches understand the requirements contained within. Thank you for your prompt attention in getting the Participation Agreement signed, completed and returned and please be sure to communicate these requirements to your Club Officers, Coaches, Management and Players accordingly. Assistant Referee (Touch Judge) should be approached and addressed ONLY to advise of intended substitution. Any interference in the performance of the Assistant Referee’s duties will be subject to sanction and disciplinary review. •	No one inside 22m lines. Should a Club have a specific question as it relates to their home pitch and their ability to comply with the TRU’s policies; the Club can discuss and determine proper field protocols with the TRU Director of Competitions. The pilot field-barrier program policy was tested in the 08-09 & 09-10 competitive cycles at various venues, divisions and tournaments with positive results. These Options have been refined based upon Club & Referee inputs to give Clubs options that can accommodate their respective field facilities. The host club is responsible for determining which Option they employ and must advise the visiting club of the Option employed. It has been found that close proximity of the spectators to the reserves & coaches fosters problems beyond safety. Separating the spectators from the coach(es) and reserves allows the spectators to enjoy the match without the input from the participants. Additionally, it allows the Match Official (Referee) to keep better control of the sidelines. Remember, there are fairly strict rules regarding who can and cannot be on the field of play. Coaches are NOT permitted to enter the playing area during a match except by invitation of the referee at half time, or other extraordinary occasions. [Ref: law 6C.2, 3}. This policy applies to ALL matches, including youth matches. Water carriers and medical personnel may enter the playing area by prior arrangement, or at the specific invitation of the referee. Referees are urged to be vigilant in applying this law to coaches masquerading as water carriers or trainers or to coaches entering the playing area uninvited at stoppages for injury, conversion kicks, and the like, and to enlist the aid of the relevant captain in curbing such infringements. Penalties for unsportsmanlike conduct may be applied. This requirement is mandatory effective October 15, 2010 and Match Officials (Referee) will have authority, at his/her sole discretion, to post-pone the match if the field is not properly roped, marked or prepared for play in compliance with TRU requirements. Referee match reports will be the primary method utilized to monitor compliance. Visiting clubs are encouraged to report non-compliance, post match for TRU to address with Host club. The existing requirements to have Goal Post Pads, Field Flags and properly marked fields shall continue to be in effect and failure to meet these will also have the same penalties imposed. The primary monitoring of these existing requirements shall be done by the TRRA assigned Referee and will be documented in the Referee’s post match report to the TRU. •	Both coaches should review the assigned team areas at least 30 minutes prior to kickoff. •	If both coaches cannot agree to a suitable resolution, the respective coaches, must notify the referee before kickoff. •	Coaches can NOT agree to waive the stated policy requirements by mutual consent. The Deep South Rugby Referees Society is hosting a Level 1 Referee Clinic on Saturday, August 28th from 9:00 to 5:00 in Birmingham Alabama. The class will be held at the Corporate offices of 365 Inc. located at 3027 6th Avenue South in Birmingham Alabama. Please bring your lunch, and dress for activity. You may register online or at the site. The TRRA Referee Conference is this weekend, June 26th in San Marcos, TX. Purpose: The conference is intended as a vehicle for information exchange and networking between Texas rugby referees, coaches and players. 1. 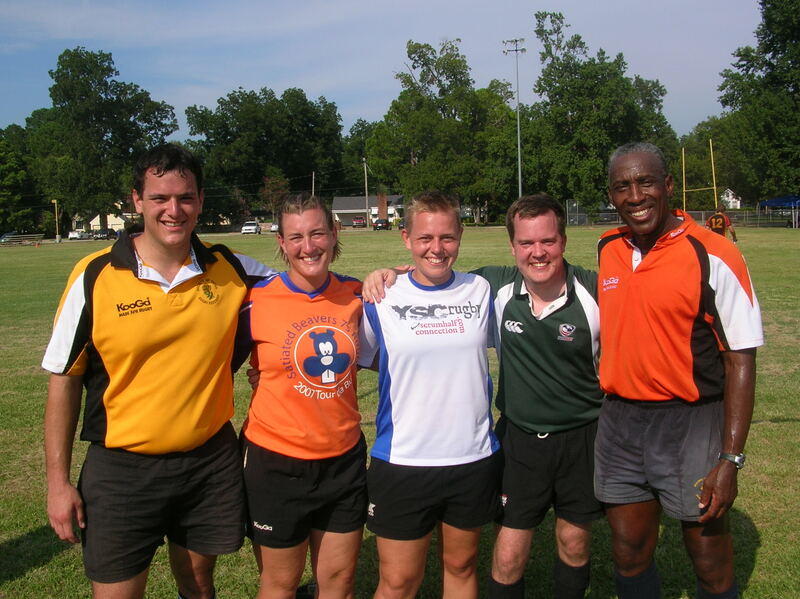 To provide Texas rugby referees with a networking opportunity outside a match/tournament environment. 2. To provide a forum for active discussion of rugby law theory and practical application. 3. To promote consistency and higher referee standards among Texas rugby referees. 4. To discuss ideas for the improvement of the referee training structure in Texas. Who’s Invited: All referees, coaches, and players from around the TRU. 1. Dress for Activity – Rugby gear is recommended. Shorts, t-shirt, and athletic shoes will do. Hats and sunscreen are also a good idea. 2. Bring your whistle and law book – the morning session will include active participation by everyone. Running the drills will be hard work for referees, coaches and players. We will work on using ‘law book’ language for both preventative work and applying any necessary sanctions. 3. Bring plenty of water or the sports drink of your choice – water will be provided at the field, but it’s still a good idea to bring your own. 4. Bring swim trunks and a towel – immediately after the conference, there will be a social swim at the San Marcos River (easy walking distance from Jowers Center). Lunch: Lunch will NOT be provided. We will break for lunch at approximately noon, and reconvene at 1:00. See the attached document for information on local restaurants. The date for the TRRA Level 1 Referee Certification course is still the same as originally announced – Saturday, June 26th, 2010. To clarify, the course will be located at Jowers Center on the campus of Texas State University. 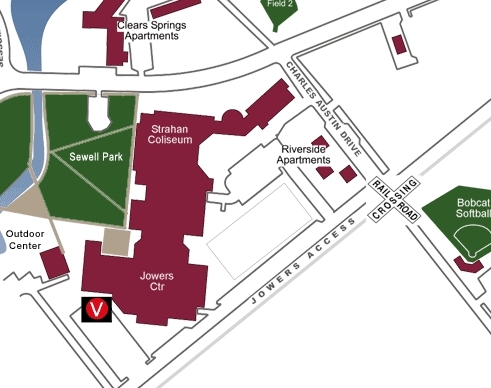 Jowers Center is connected to Strahan Coliseum – a Google Maps search for “Strahan Coliseum, San Marcos TX 78666” will get you a map of the immediate area. The most convenient place to park is in the lot directly behind Jowers (NOT along the street next to the field or in the Riverside Apartments lot). Access to the classroom is easiest from the back of the building. Follow Jowers Access Rd all the way to the back and turn right into the parking lot adjacent to the building. Online registration for the Level 1 Referee Course in San Marcos, TX is now posted and open. If you have any questions, please feel free to contact James Summers (summersjw@austin.rr.com) or Greg Puklicz (gpuklicz@madycorp.com). The TRRA has informed the Union that due to lack of interest, they are cancelling the Level 1 course scheduled for Sept 26 in Dallas. This is an unfortunate situation as the need for referee’s continues to grow in comensurate with our Youth, Collegiagte and Senior programs which are all experiencing steady year over year growth. The rugby community’s failure to identify, train and develop new referee’s will materially limit the growth of the game as a whole and we will need to look at new and possibly more drastic ways to service the games we have. Rich has graciously offered to teach a course himself in November. A new date will be published and emailed out to the members. The TOLA series capped off it’s finals at the Shreveport-Horseshoe TOLA 7s Aug. 8-9, 2009. Host club Shreveport won in overtime against a well-coached Little Rock Club. National women 7s coached, Julie McCoy had her boys playing great rugby but Hal Struckman and his Shreveport gang stood tall at the end and came away with the victory. Greg Varnell was in the middle with Wendy Young and Rich Prim assisting on the touch. Mr. Varnell did an excellent job. We had a good crew of match officials during the weekend; from the very new to the very, very old. Match officials included Chris Kelly, Traci Schmidtke, Wendy Young, Greg Varnell, Rich Prim and visiting referee from the deep south, Chris Piscotta. Congrats to a strong referee crew and kudos to a great job the Shreveport team provided as host on this very hot Aug. day. Match officials included in photo above from l to r: Chris Kelly, Traci Schmidtke, Wendy Young, Greg Varnell, and Rich Prim. Our visiting referee from the deep south, Chris Piscotta, was not available for the picture.